Mr Au Wei Keong, 22, likes to get his hands dirty if it helps solving problems. Read more to find out how he puts practical knowledge to good use under such circumstances. 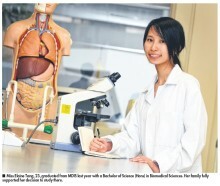 Miss Elaine Tang, who was from Junior College, graduated from MDIS with a Bachelor of Science (Hons) in Biomedical Sciences. She explains why MDIS is good option for degree courses.